PT Len Industri (Persero) - LEN or referred to as "LEN Industri" is a well-established state-owned company, running business in industrial electronics sectors. Headquartered in Bandung West Java, LEN Industri has core competencies in the field of technology, electronics for industry and infrastructure. LEN Industri now has 6 business portfolios, comprise of defense electronics, renewable energy, control systems, navigation systems, telecommunication and rail transport. PT LEN Industri (Persero) is a non listed state-owned company and completely owned by the government of Indonesia which represented by the Minister of State-Owned Enterprises (SOE). LEN Industri was first established in 1965 and originally registered as a government-owned research agency under the name of National Electronics Institute - Indonesian Institute of Science (LEN - LIPI). PT LEN Industri (Persero) was established as a limited liability company in 1991 under the Government Regulation No 16 of 1991, the State Gazette No 22, dated 9 March 1991. LEN Industri has 2 business units; Business Unit of Energy and Retail Product and Business Unit of ICT. LEN Industri also supported by 4 subsidiary companies, namely PT LEN Railway Systems, PT Eltran Indonesia, PT Surya Energi Indotama, and PT LEN Telekomunikasi Indonesia. In term of financial performance, LEN Industri performance achievement throughout 2016 showed satisfactory results. 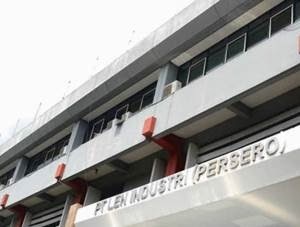 According to information found in PT Len Industri (Persero) Annual Report 2016 as cited by JobsCDC.com, LEN Industri registered a 22.38% growth in total assets of Rp3.87 trillion as compared with Rp3.16 trillion in 2015. Referring to its annual report, LEN Industri booked total revenue Rp2,325.17 billion in 2016 or 3.80% growth as compared with Rp2,239.99 billion in 2015. Education background from any engineering majors. Able to work in long shift. Strong communication skill in English and Bahasa Indonesia. Have a capability of managing time in the site. Have work experience is an advantage. Education background from Diploma Engineering, preferably Mechanical. JobsCDC.com now available on android device. Download now on Google Play here. Please be aware of recruitment fraud. The entire stage of this selection process is free of charge. 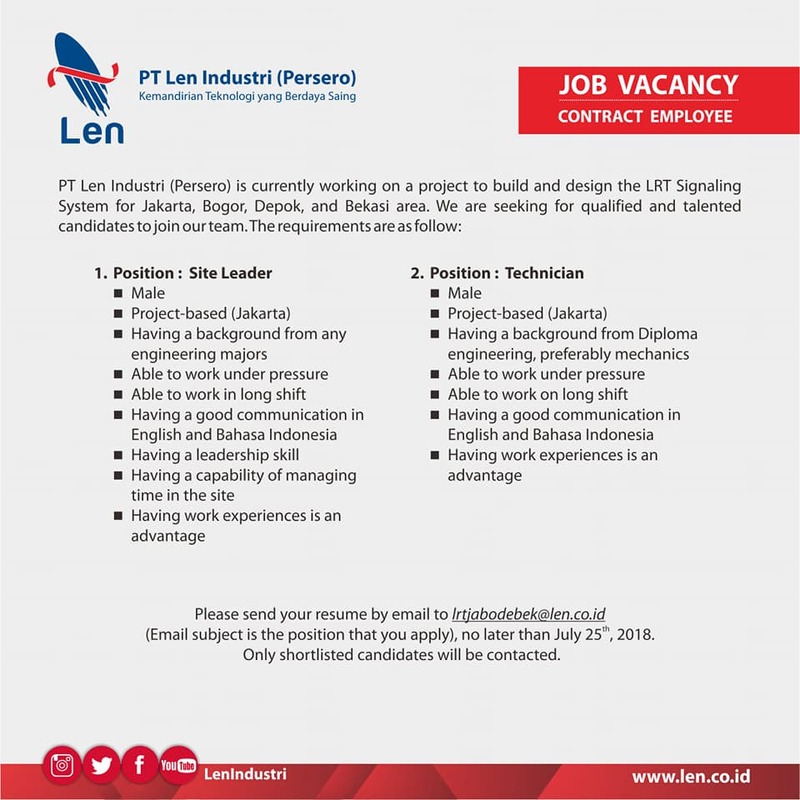 PT Len Industri (Persero) - Technician, Site Leader LEN Industri July 2018 will never ask for fees or upfront payments for any purposes during the recruitment process such as transportation and accommodation.